As we plan ahead for the 2014-2015 school year, we are eager to inform you of the opportunities your student has living in a Zone of Choice (ZOC) attendance boundary area. Zones of Choice are identified as a geographic area comprised of multiple high school options. Based on your home address, your home school will be one of the school choices that make up your local Zone of Choice. Students residing in a Zone of Choice are eligible to attend ANY school in the Zone. 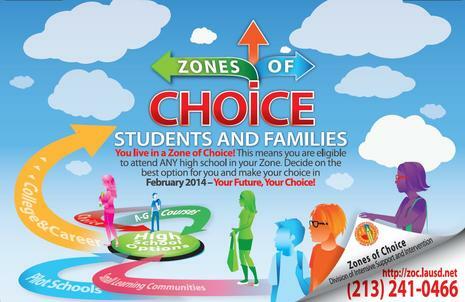 Zone of Choice options will offer students an opportunity to meet their individual academic interests. The smaller school settings provide an environment allowing teachers to know their students well, students to make strong connections to their school, and parents to become more actively engaged in their child’s education. You can find more information on the high school options available in the your Zone of Choice by visiting the Zones of Choice website (http://zoc.lausd.net) and clicking on the link for your Zone. Please keep in mind that your middle school student will have to apply for enrollment in February 2014. Students attending a ZOC feeder middle school will apply for enrollment in their respective middle school in a computer lab during the first two weeks of March. Once students have ranked their high school choices, they will receive a “Parent Confirmation Letter” printout to bring home for your review and signature. The deadline for submitting the signed letter to your middle school is FEBRUARY 28, 2014. Students will then be placed using a random computerized process that takes into account the student’s preferences. Students will receive a letter of acceptance from their designated school once they have been placed, and will report to their assigned school on the first day of school. We are very proud of the programs offered by Zone of Choice schools, and we are confident that your experience next school year will be a positive and productive one. If you have any questions, you may call us at (213) 241-0466.